Day three we decided to start at Disneyland and try for the Peter Pan ride that everyone was lined up for in Fantasyland yesterday. We got there pretty early but the wait was already 30 min long. We went for it. The line moved along pretty nicely but it did take a while. We tried to put on his little stuffed animal back pack leash thing but he didnt like it. 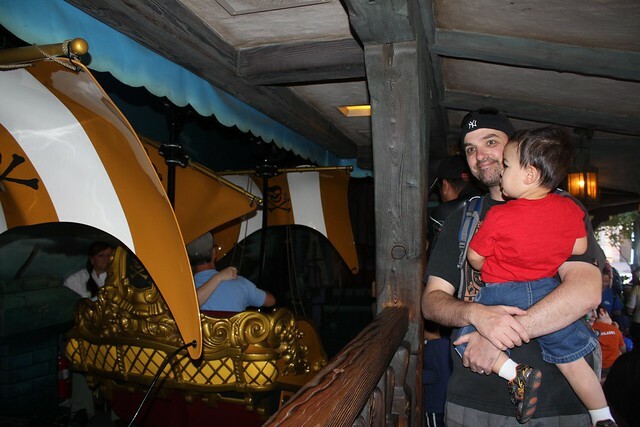 The little boats we got to ride in where pretty neat – its a “floating” ride (tracks at the top instead of the bottom) so it feels like your hovering on air. 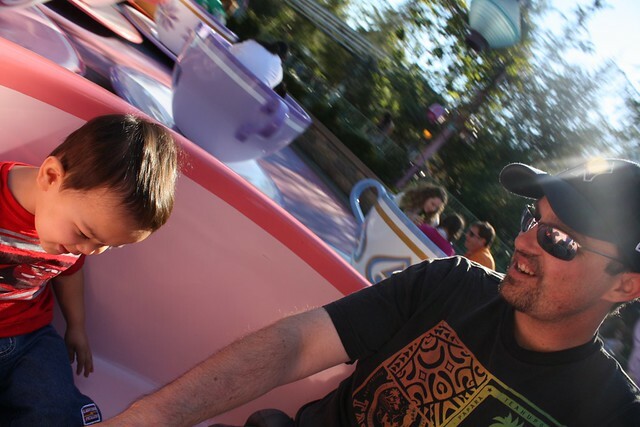 Vinny doesnt know the story of Peter Pan so i am not sure what he thought of it. 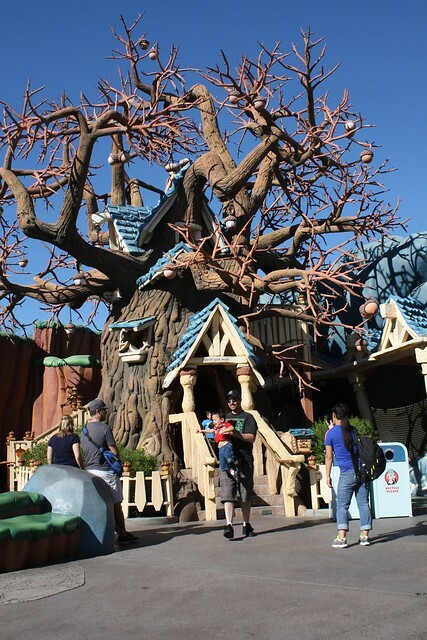 But i thought it was pretty good for a little kid “story book” ride. 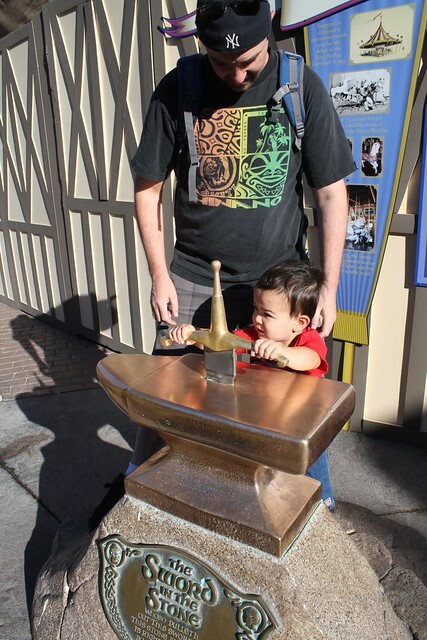 After that we saw the sword in the stone so we tried to pull it out. No luck. 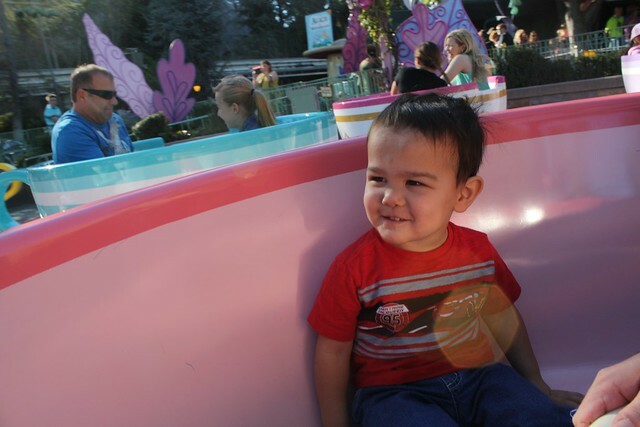 Next up – Tea Cups! 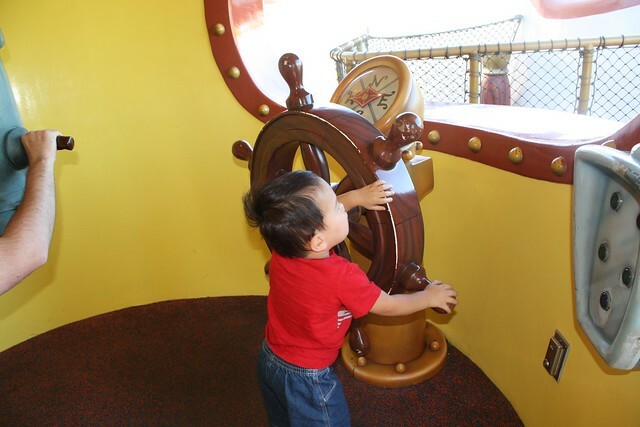 I dont think i’ve honestly ever been on this ride, because i hate things that spin in circles. But i thought Vinny might like it, and there was no line. So we hopped in. 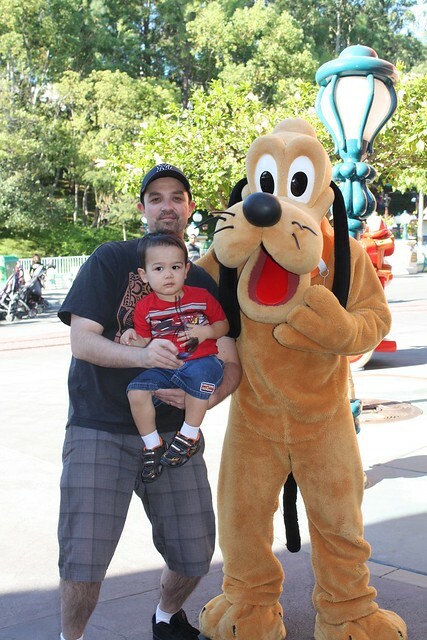 Vinny had a blast! 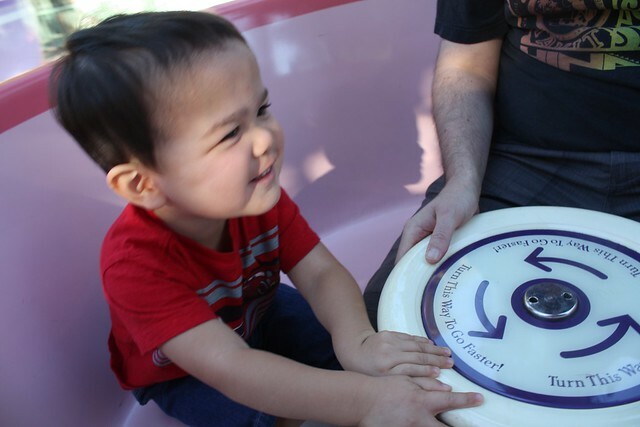 Probably one of his favorite rides. 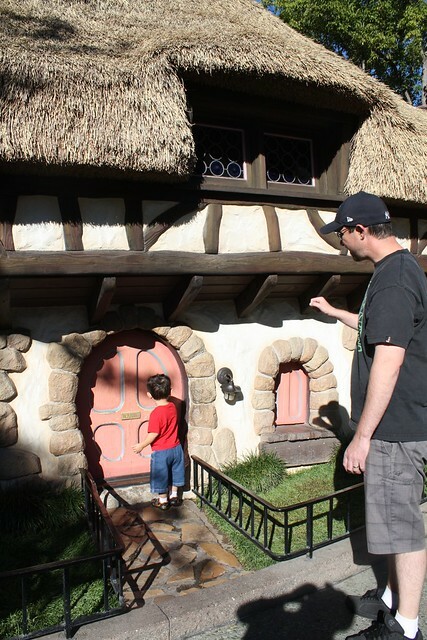 Saw Mr. Rabbit’s house so i told Vinny to go knock on his door. Guess he wasnt home. 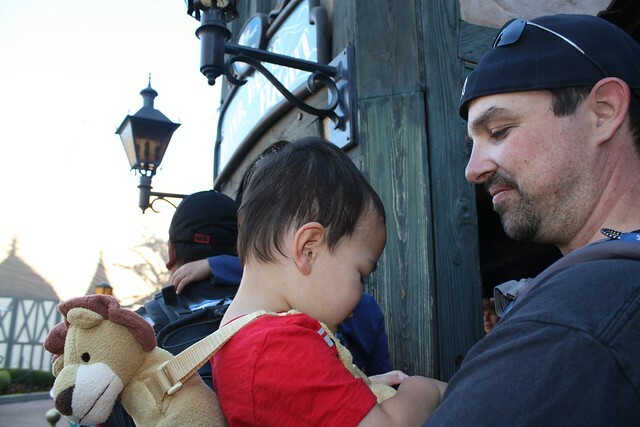 Headed over to Toon Town next – which opens a little bit later then the rest of the park, so it was kind of a ghost town when we got there. Its in the corner of the park too, i think people hadnt’ quite made it there yet. 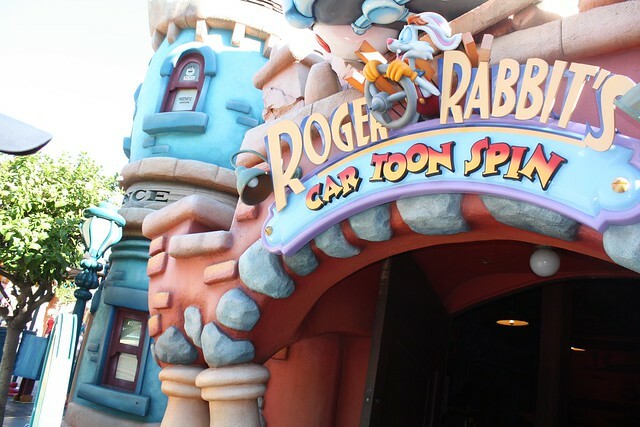 We went on the Roger Rabbit ride, which was pretty scary actually with lots of boings and loud noises. But its a fun crazy car-spin ride. Again, i’m not sure what Vinny thought of it. 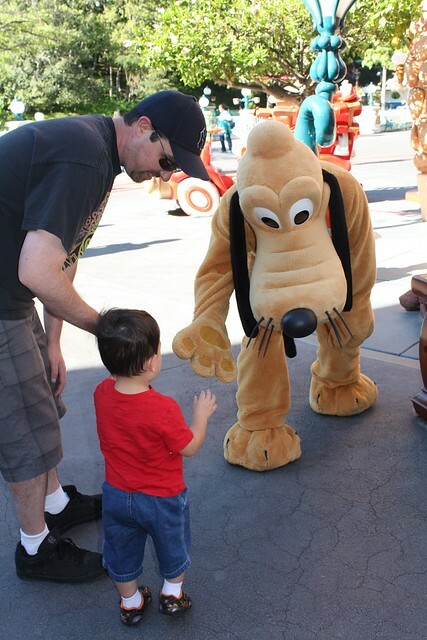 When we were done with that ride, Pluto was hanging outside, so we got to play with him for a bit. 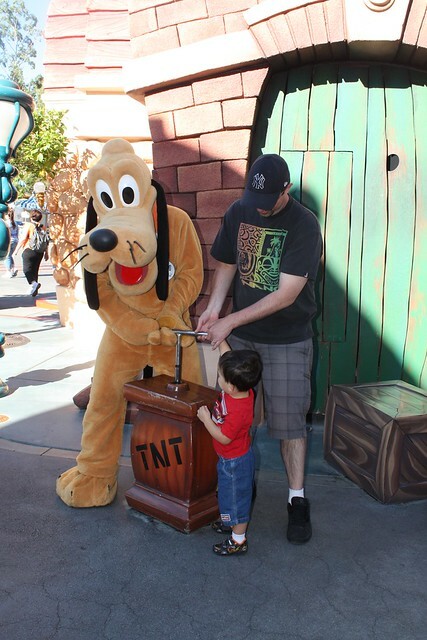 Pluto was the most interactive of all the characters, playing with the stuff in Toon town. 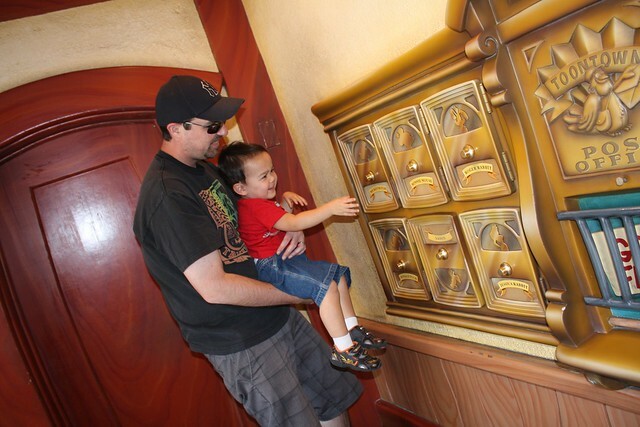 We checked out the local post office and heard some funny characters. 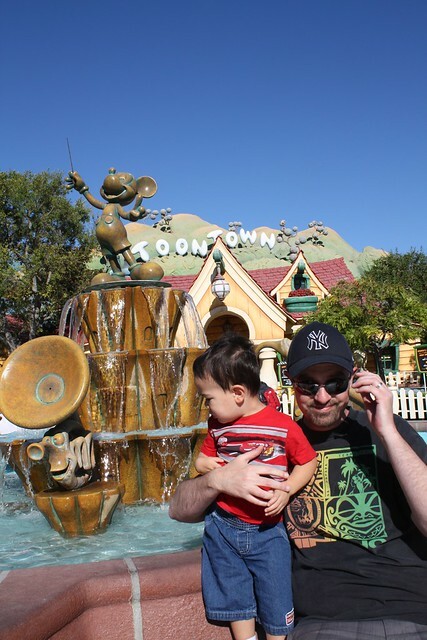 I wanted to get a picture with the toon town sign in the background, but Vinny just wanted to play with/ look a the water fountain behind him. 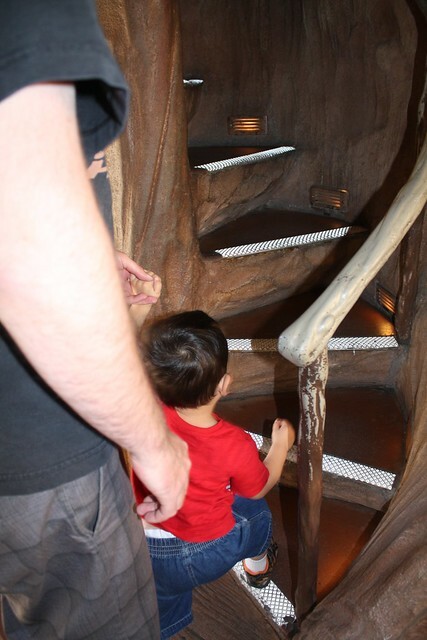 Next we went to Chip n’ Dale’s Treehouse which was basically just a set of tiny stairs in this fake tree, but Vinny LOVED it, he went back 3 times, and then totally cried and put up a fit when we had to leave. We got to see Donalds boat house. 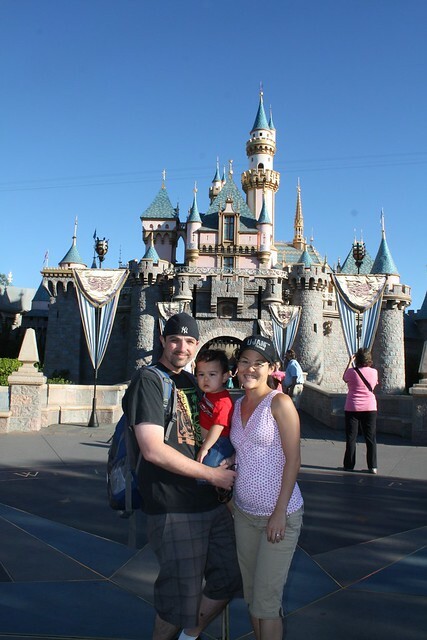 And also went back to Goofy’s place to play on his playground. Tried to get a good picture on the pumpkin — wasnt happening. 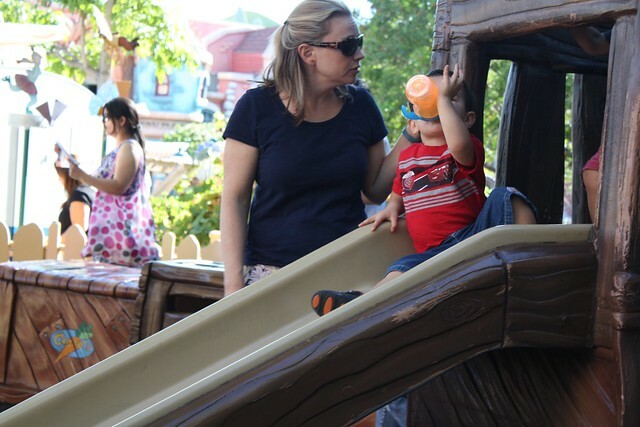 He ate his snack here and kept going down the slide with his sippy cup! 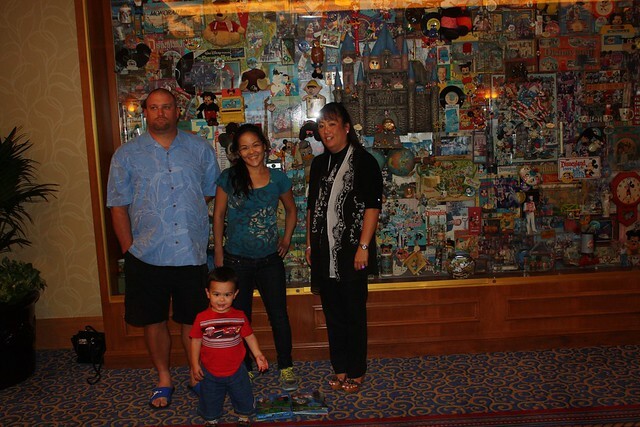 Whattya know, when we leave Goofy’s house he was standing right outside the door! 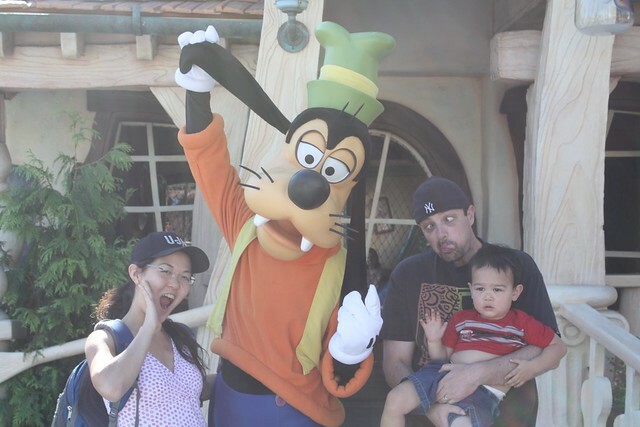 We took a “goofy” snapshot with him. We went to lunch on the walk back from the park to the hotel room. We ate at Millie’s Diner. 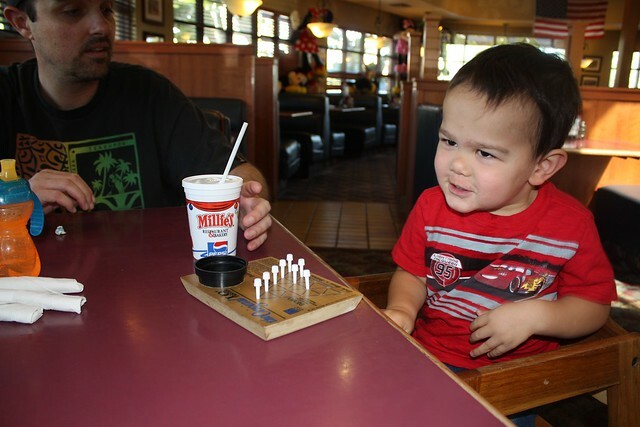 They had a peg thing at the table and first thing Vinny does was try to eat it. But then i showed him how you stick it in the holes and he thought that was really fun. Back to the Hotel for nap. He is so funny in his pack in play, trying to do headstands and throw out all his toys before he finally falls asleep. 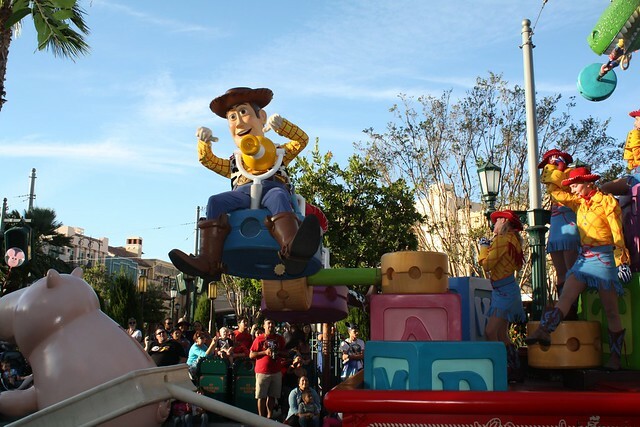 There was a Disney Pixar parade i read about on the Disneyland app, and it had characters from some of the movies Vinny has seen, so i thought he might like it. 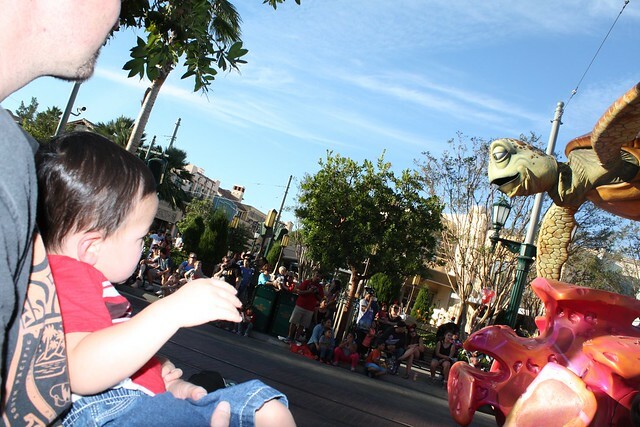 Especially since i knew he liked meeting the characters in “real life”. We got there just as it started and snagged a pretty good spot. 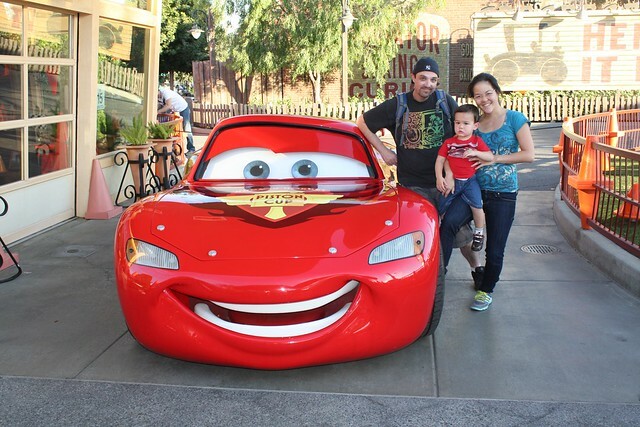 We were disappointed at the end because they said Lightening McQueen would be there but he wasnt! 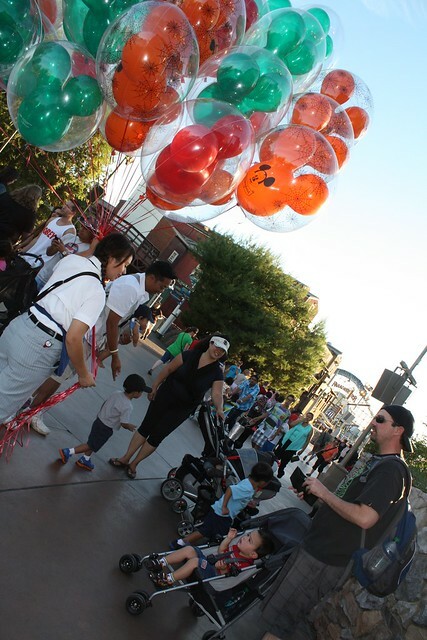 We walked around Radiator Springs / Carsland area a bit more before we had to head to meet my cousins for dinner. 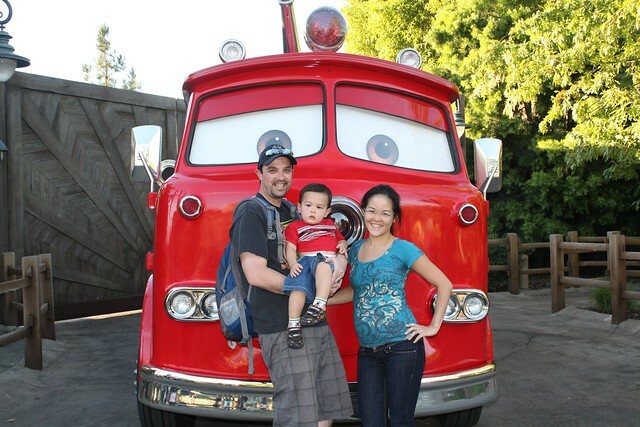 We saw the fire truck again and got to take a photo with him. And THEN! What do you know! 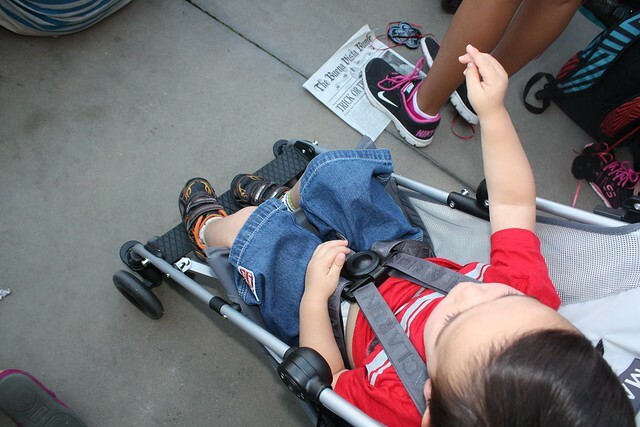 A little further down, there was Lightening McQueen! So glad we found him! 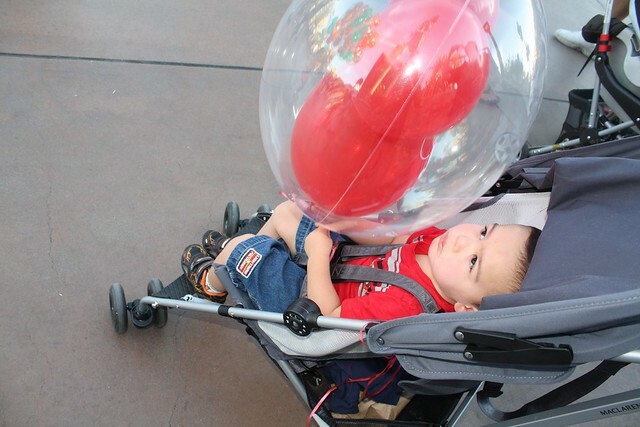 Heading out of the park we saw Mickey balloons, and well, we know how much Vinny loves balloons, so we had to get one for him. 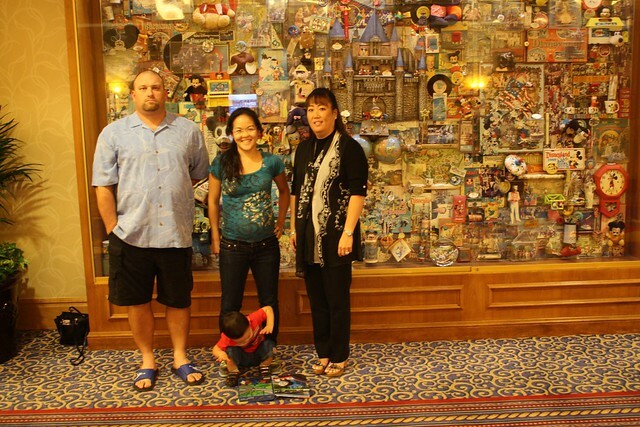 We met my cousin Candace and her husband Don for dinner at the Disneyland hotel steakhouse restaurant. It was a bit fancy, and we weren’t dressed the best and had a toddler, but it seem to work out OK. Vinny behaved nicely, though he was really loud and happy and it was hard to keep him quiet. Speaking of loud, while we were at the park, Vinny would do this thing where he covered his ears. 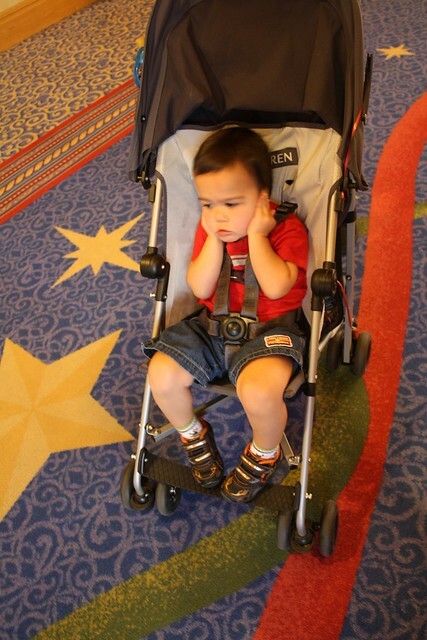 I think he thought it was too loud in the park or he was just tired. He wouldnt cry or do anything else but flap down his ears. It was kind of cute and funny. Anyway, dinner was AWESOME, Don, Jeff and I had the prime rib, and its not normally something i order but it was so good with the au jus and the horseradish! YUM! I was supposed to meet my other cousin there, Sandee, but she had to work last minute. LOL, couldn’t get Vinny to concentrate for a picture because he loved that Thomas book. But then he saw the flash go off on the camera. 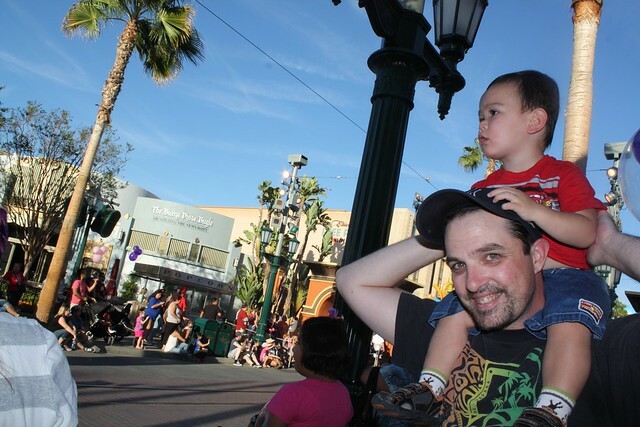 We walked back to California Adventure and wanted to try to catch the light show that was cancelled the first night we were there. 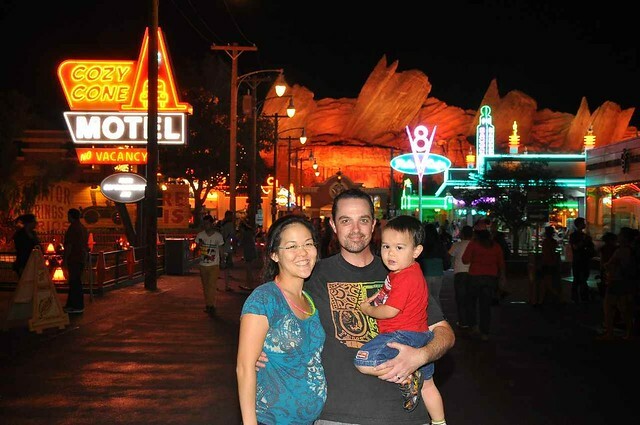 We were able to take this photo of Radiator Springs! Neat shot! We went to the same spot we were at last time, and waited for the show. It came on and was pretty neat, but it was a little long and kind of the same-thing after while, so we decided to just start heading back since it was late by his time (just about 10pm). 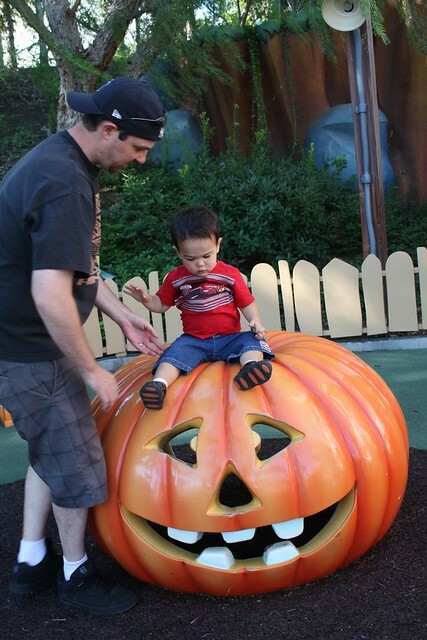 We were sad it was out last night at the park, but we really enjoyed ourselves!